Manny Salvacion for YIBADA: Robotics education and its important application in engineering has reportedly taken off in China over the past years, as robots have become increasingly popular among people, the China Daily reported. Liang Yujun, head of the science education department at Beijing Youth Center, said that there are nearly 300 primary and middle schools in Beijing offering robotics-related curricula and activities now. Liang is in charge of robotics education in the capital and also the general referee of the national youth robotics activity. According to Liang, only about 20 schools had such curricula and activities in the early 2000s. 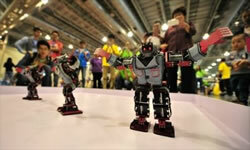 The report said that about 3,000 registrants from 160 schools and extracurricular teams participated in the 2014 Beijing Student Robotic Intelligence Competition. "We have to hold the competition in one of the city's largest sports fields now, which can accommodate the increasing number of players," said Liu Yi, who is charge of running the competition at the Youth Center in Haidian District.